Chicken Shipping 101 Mailing a Chicken through USPS | Cornerstone Services, Inc. I know what you’re thinking… you always wanted to ship a chicken to someone special, but you were not sure how. Here is the Cornerstone Services Inc. step-by-step instructions for making your chicken shipping dreams come true. Follow this guide to ensure the chicken mails safely and successfully to any destination across the United States. In compliance with USPS Publication 52 Section 526.4 (“Live Adult Birds”), chickens are indeed mailable when also shipped in accordance with USPS DMM Section 601 (Mailability) Subsection 9.4.3 as well as USPS Publication 14 (“ Prohibitions and Restrictions on Mailing Plants, Animals, and Related Matter”) Chapter 5. Of course, there are rules for everything government-related, but basically your chicken must comply with common sense measures. They must be disease-free, can’t be dead already and weigh at least 6 ounces but not over 25 lbs. No, Kevin, you can’t just go get an empty wine box, punch holes in it and duct tape it. Here’s the list of USPS Approved Manufacturers of Adult Birds Mailing Containers, a rare instance of the Postal Service’s working with specific industry manufacturers to create something useful for both. Here’s a further example of a single chicken shipping container. A 18″ length x 20″ tall x 8″ wide compliant chicken shipping box. Perfect for sending your maximum 8 lb. weighted fowl. The approved chicken shipping containers must be designed with consideration of the birds’ comfort, awareness, health, and welfare. In addition, the container must (a) remain intact and withstand crushing during transportation. (b) Prevent the bird(s) from puncturing or breaking any part of the container with their own force, or escaping from the container. (c) Contain shavings or similar absorbent material to prevent damage to the bottom of the container. (d) Have a plastic window for inspection of the birds; such window must be covered by a fiber board flap that can be lifted for inspection. All this implies that it’s best to get the approved containers and leave it to the chicken-shipping professionals. Step 2. Mark Your Container: Create a Large SHIP TO / FROM Address Label; write “ONE CHICKEN” in large letters; write the word “UP” and use directional arrows. Your parcel must be marked appropriately as required by U.S. Code of Federal Regulations, Title 50 – Wildlife and Fisheries, Subpart H (Marking of Containers or Packages), sections 14.81 and 14.82: “each container or package conspicuously on the outside with both the name and address of the shipper and consignee” and “an accurate and legible list of its contents by species scientific name and the number of each species and whether or not the listed species are venomous must accompany the entire shipment.” There you have it – no sending venomous chickens to Uncle Phil. Now, our professional retail experience with the Postal Service is this – if they don’t see it every day, you’re going to have to reassure them it’s do-able, and we bet that your local PO doesn’t do chicken shipping every day. And, not just any Post Office can accept chickens for shipment; typically, only larger post offices handle this service. 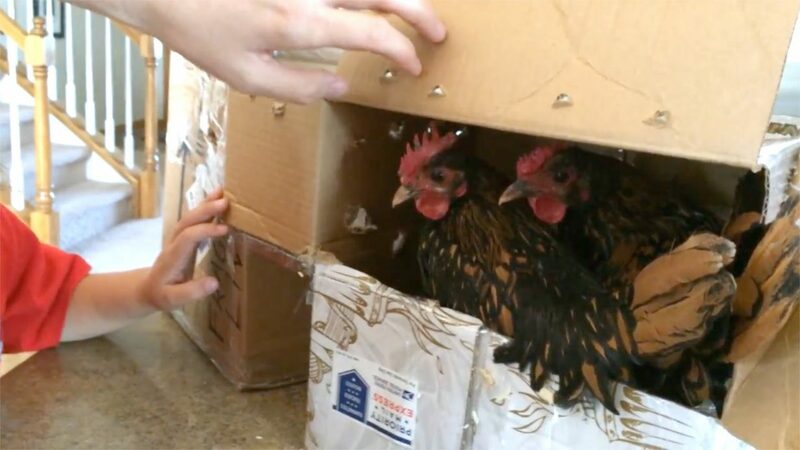 Internally, an US Post Office location which is shipping live animals likely had to get internal training and clearance for proper handling, but it’s up to you to find this out in advance. To the Postal Services’ credit, there are internal postal service best-practices guidelines for handling live anything (e.g. 4-hour time limit for live animals in postal trucks). To call ahead, the USPS wants you to go here to the USPS Post Office Locator online service for post office retail branch information, but you won’t find phone numbers. We suggest instead that you try an unofficial USPS online resource such as Postal Locations.com which lists phones. Calling ahead is a really good idea – just explain what you’re trying to do well in advance and get guidance on where to send your chickens. Also important – you have to send birds via Priority Express Mail. “Adult birds are mailable only when sent by Priority Mail Express service”. Pricing and acceptance guidance may be found using the USPS Postage Price Calculator whereby both weight and destination are factored into final costs (but expect to pay between $35 and $75 on average). (a) do not ship late in the week such as on a Thursday or Friday; (b) download the free USPS Mobile iPhone app which has the Informed Delivery feature to track the delivery of the package; and, (c) use the USPS Click & Ship service to save approximately 15% on your package. In case your chicken dies in transit… we’re sorry for your loss, and so is the USPS — refunds are rare with limited liability only for “damages during shipping”, and not applicable to Priority Mail Express parcels shipped within 3 days. Check out The Omar Gosh Vlogs video on YouTube for an informal example of how it was done! Image and video are property of Omar Gosh Vlogs.